What might Christmas mean to the Freemason? Certainly Freemasonry is not a religion, Christian or otherwise. It leaves the determination on spiritual matters to each individual Mason, so long as he believes in the Almighty Creator. But there are certain messages from the story of Christmas that are applicable to all Masons, not just those who celebrate a certain birth on December 25th. Many Christians feel God gave his greatest gift to mankind, and that Gift’s birth is marked on Christmas Day. The spirit of giving is also outlined in our Masonic ceremonies. The new Entered Apprentice is reminded in the northeast corner of charity, and to practice it whenever possible. That is the monetary aspect but there is another kind. The one referred to in the Charge in the same degree which admonishes us to relieve the distresses of our neighbor, soothing his afflictions and to do to him as you that he should do unto you. In other words, the Golden Rule, from the Sermon on the Mount. Christmas is a time of faith for our Christian brethren. But all Masons are reminded in the different degrees of the principle of Faith. In the explanation of the First Degree Tracing Board we hear that we are to be ready and willing to adore the Almighty Creator. Therefore, let this time of year serve as a reminder to all Masons to practice their faith, whatever it may be. So, let this season of the year remind all Masons, no matter what their religious beliefs, to follow those universal tenets of our Craft and the 18th Degree(Knight Rose Croix) – Faith, Hope and Charity. In so doing, satisfaction should come upon us at this Christmas time. I hope you can join us for the annual Children’s language Clinic Christmas Party to help celebrate the season with our kids and their loved ones on December 1st, and our December Stated Meeting and Dinner on December 11th. 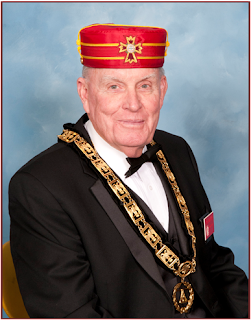 December 4th we will hold our Scottish Rite Night of Instruction and Agape Dinner.